Prominent & Leading Exporter from New Delhi, we offer horizontal type dynamic balancing machine and vertical type dynamic balancing machine. Ours hard bearing type horizontal two plane Dynamic Balancing Machine with microprocessor based / micro controller based measuring panel. Machine Model FBM-(M) is most suitable for balancing of different types of rotors like rotors of Electric Machines, Fly wheels, Crankshafts cylinders, Submersible Pump rotors, etc. 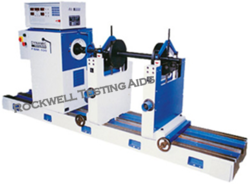 Working of these machines is very simple, Double start push button is provided to start the machines. The cycle is fully automatic which starts the machine, measures and stores the unbalance in gms along with the angle for two selected planes on digital display simultaneously & stops the machine (with brakes, if machines is provided with electrical braking facility). The measuring cycle takes around fifteen seconds for smaller rotors. For higher capacity machines, the drive is provided through motor, To avoid any damage to drive coupling and other rotating parts in drive systems, electronic soft starter is incorporated with machine. Key board facility is provided on measuring panel for data feeding of dimensions like A, B, C, RL & RR tolerance limits for both correction planes i.e. TLL, TLR can be fed so that when rotor is balancing within specified limits, respective LED glows up, indicating no further correction is required, For more detail please refer feathers of microprocessor based / micro controller based panel for dynamic balancing machines. To increase the capacity of machine for extra long rotors additional bed lengths can be provided, which can be aligned along with basis machine beds, Facility for additional bed with gap bed arrangement is also possible to accommodate bigger diameter rotor. Higher capacity machines above 7000kg are provided with fixed separate drives and hence gap bed design is not possible for these machines. 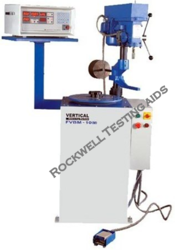 Ours Vertical Balancing Machines are extremely robust and resistant to external adverse influences. The rough workshop environment in both one off and large volume production is where vertical balancing machine can prove their strength, Hard bearing type single plane vertical balancing machines are designed after years of experience. Occasional overloading caused by large initial unbalance or rotors which are slightly outside the specified weight range, are never a problem. Regardless of your application requirements. Our vertical balancing machine will provide precision unbalance measurement and dependable long term stability. Vertical machine applications range from balancing in the repair workshop to fully automatic mass production. Manual, semi or fully automatic processes are available to meet the needs of any balancing of disc type components like flywheels, clutch plate, impellers etc.